We will not hold a Wise Crackers night in 2015 or 2016. Valentine's Day ♥ Saturday, February 14 ♥ 7:30 p.m. Couples ♥ Singles ♥ Groups ♥ Everyone needs to laugh! Seating is limited, so make your plans now, and purchase your tickets before they’re gone! Doors open at 6:30 p.m. 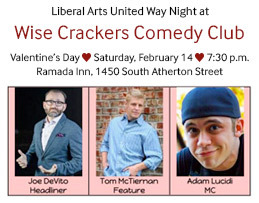 Wise Crackers Comedy Club tickets that you purchase through the Liberal Arts United Way can be used at any Wise Crackers show this season except for March 6 and 7. $5 from each ticket sale goes to benefit Centre County United Way.